Observed in a demonstration garden near Kitale, Kenya, December 2012. If a Malacologist happens upon this page, hopefully he or she will be able to put a name on this fascinating land snail. 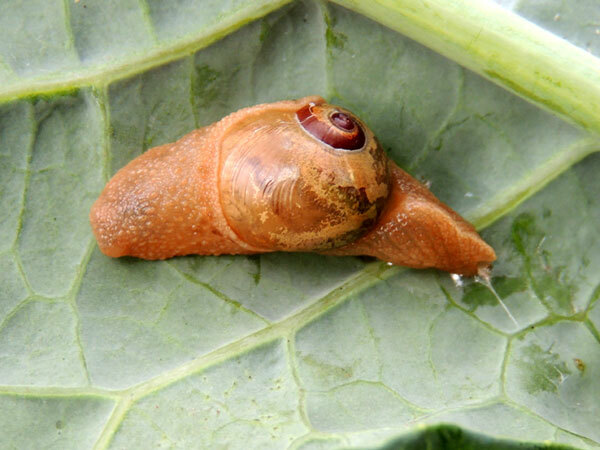 Many land snails, but not all, are either herbivores or detritivores. This specimen was observed feeding on the leaf tissue of a garden cole plant. Another of the same species was feeding upon a bird dropping. It appears that this snail species is midway between a typical snail and a slug. Slugs are snails that have lost their shelves by evolution.